During TMCs first Wearable Tech Expo in 2013, I saw a device that was originally designed to be a Bluetooth headset that was sewn into the headband of a hat. In this case it was a baseball cap, but it could just as easily be attached to any hat. It functioned perfectly as a Bluetooth headset and could be connected to a smartphone, MP3 player or any Bluetooth device. It turns out that it also functioned incredibly well as a hearing aid. The device was created by a company called Max Virtual and last year’s version of the cap is called Cynaps Enhance. I was blown away when I first saw the cap in action. Just imagine a baseball cap that can help people with certain types of hearing disorders to be able to listen and hear what is being said! It is not every day that you see a potentially life changing medical gadget that found its inspiration in video games. What makes this possible is bone conduction, which is the conduction of sound to the inner ear through the bones of the skull. Bone conduction transmission can be used with individuals with normal or impaired hearing. I am one of those who in the past stuffed the earbuds in my ears and cranked up the volume. It was perfect for drowning out all of the noise around me. My hearing is not what it once was. In fact, a study published in 2010 in the Journal of the American Medical Association found that nearly one in five U.S. teenagers already has some degree of hearing loss, probably as a result of listening to loud music while wearing earbuds. This problem could be eliminated if there was a way to listen to music and videos without putting anything in your ears. Many times when a new technology is being developed, it comes to pass that the technology itself can actually be used for a variety of different scenarios. One thing I have learned from all of my previous lifetimes is how quickly things change. Well, not so much change as advance and improve to the point of change. Due mostly to advances in the technology behind a device, it is not uncommon these days to see improvements every couple of months. Something that I find more interesting is how technology from a different field can help the development of completely unrelated products and devices. Today, Max Virtual is launching a new Indiegogo campaign, which is now the company’s third campaign. The latest device has been named Cynaps Mint. While the Cynaps Enhance was one, if not the, first bone conduction headset, we have seen several companies follow suit with their own versions. Another first for Max Virtual is that the Cynaps Mint is the world's first 3D-printed, bone conduction headset, which can also be disassembled and installed into any headgear. Since I did mention that other companies also have bone conduction devices, you might be thinking “3D printing, so what else makes the Cynaps Mint so special?” Wouldn’t it be impressive if you could turn just about any object into a speaker? Imagine connecting the device to a window, such as the image below, or a desk top and listening to your playlist. 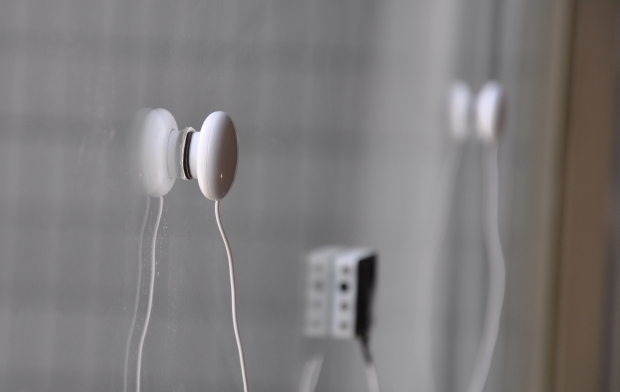 The Cynaps Mint is the world’s first stereo vibration speaker, meaning that it can be placed onto a pair of surfaces to effectively turn them into a pair of stereo speakers. We have seen a lot of uses for 3D printing from construction sites to medical laboratories. Due to the convenience and flexibility of 3D printing, Max Virtual is able to offer every backer during the campaign a personal choice of 1,000 color combinations for their Cynaps Mint. Mike Freeman, who is Max Virtual’s CEO and product developer, said “I believe this range of color choice is unprecedented, and one of the goals of this project is to show how evolving tech such as 3D printing can change the game for small companies like Max Virtual.” Each order can be custom printed and assembled per the requested specs. I agree with Freeman’s sentiments that the world isn't at all what it was for us even a decade ago. What worked several years back is not cutting it these days. Those who want to really succeed will have to rethink reality much more frequently as it continues to evolve exponentially. If you are interested in finding out more about the Cynaps Mint you can visit the campaign site.